It’s been 10 years since Hurricane Katrina devastated New Orleans and regions along the Gulf Coast. This past month, many news organizations have been reflecting on Katrina – and lessons we’ve learned from it – as the region continues to recover and rebuild. Are there any lessons in the origin of the word hurricane? “Hurricane.” A depiction of the swirling-armed Taíno storm goddess, Guabancex, who commanded the ferocious storms. Ink on paper. Doodle by @andrescalo. According to the Oxford English Dictionary (OED), the earliest evidence of hurricane actually comes in two forms: furacane and haurachana. These words appear in British scholar Richard Eden’s 1555 translation of some important historical works that chronicle Spain’s exploration – er, colonization – of the Americas. One of the works, Peter Martyr d’Anghiera’s De orbe novo decades, gives the Spanish huracán; the other, Oviedo’s La natural hystoria de las Indias, gives furacán. Why were there two forms? In a phonological process called debuccalization, Spanish changed certain word-initial Latin f’s to h’s around the 16th century. So, Latin’s facere (“to do”) became Spanish’s hacer; fabulari (“to say”) became hablar. But huracán/furacán aren’t from Latin, though the pair documents subsequent switching of h and f spread by the sound shift. Huracán/furacán, rather, come from the Caribbean. Indigenous to the Caribbean were the Arawak people, including a subgroup, the Taíno, who inhabited the Greater Antilles. Spanish colonization decimated their population, but not without first taking some language, of course. In Taíno mythology, the anger of the goddess Guabancex unleashed powerful storms, or huraca’n – sometimes personified itself as an evil god of chaos, possibly derived from a powerful Mayan creator deity of wind, fire, and storms, Hurakan. Guabancex commanded Guatabá, who brought thunder and lightning, and Coatrisquie, who brought floods, forming a formidable trio that wreaked meteorological havoc. Very sadly, I can’t pull down a dictionary of Taíno or Mayan etymology from my shelf, so I can’t speak to the deeper origins of huraca’n or Hurakan with any certainty. But the Mayan Hurakan is said to mean “one-legged,” as he was so physically manifested, while some Taíno indigenous culture and heritage websites break down huraca’n as “center of the wind” (hura, “wind”; c’an, “center”). Whatever the particular origin of hurricane, both Hurakan and Guabancex wielded the destructive power of hurricanes, but both were also associated with creation. Hurakan helped create the world in Mayan cosmology. 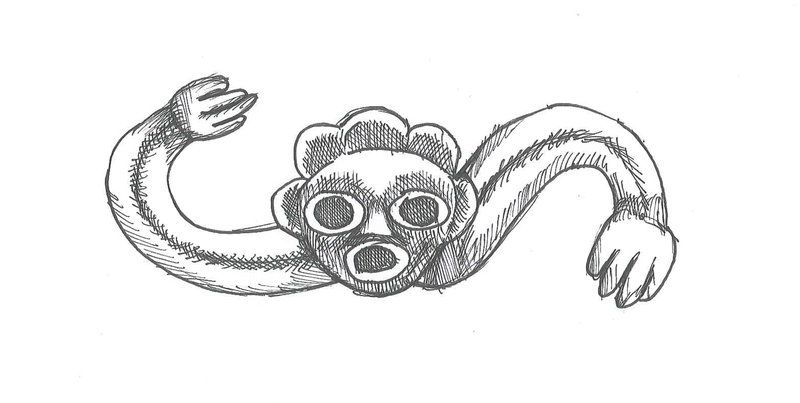 Some consider Guabancex the destructive face of the Taíno supreme being, complementary to the creative forces of nature. Neither etymology nor mythology can restore New Orleans as it was before Hurricane Katrina. Nor do their insights necessarily bring any consolation. But perhaps they can remind us of some fundamental lessons of nature – human nature included – that mythology’s dualities capture so well: Out of destruction can come the chance to make new, to make better. Out of destruction can come creation. How fascinating! Both the Caribbean origin of the word and debuccalisation in Spanish, which as a speaker, I did not know about! Thanks! Yes, Spanish’s debuccalisation is fascinating – and helpful for someone like me, who often has to use his Latin cognate powers to decode Spanish. And what a power to have!